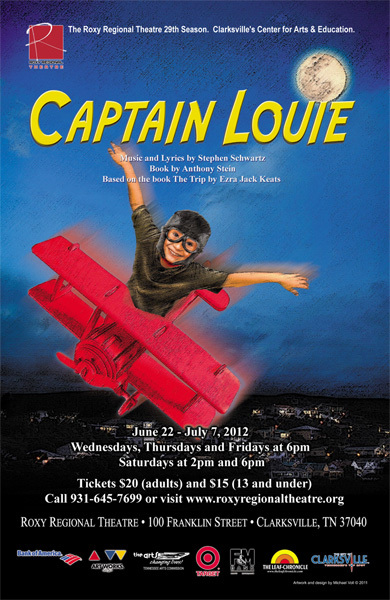 Clarksville, TN – Let your imagination take flight on a wild and magical adventure at the Roxy Regional Theatre with “Captain Louie”, beginning Friday, June 22nd, at 6:00pm. When his family moves to a new neighborhood, young Louie has to leave his friends behind. Lonely and looking for something to cheer himself up on Halloween Night, Louie returns to his old neighborhood friends in an imaginary journey on the wings of his favorite toy, his little red plane. A celebration of creativity and the power of the imagination, “Captain Louie” is about friendship — the ability to make new friends and the importance of old ones. Set to the incomparable music and lyrics of Stephen Schwartz, this endearing show is guaranteed to entertain both the young and old alike. Starring Sean Ormond as Louie, “Captain Louie” is directed by John McDonald with musical direction by Tom Thayer and features Hannah Church, Regan Featherstone, Humberto Figueroa, Erin Keas, Rob Rodems and Amy Wyer. This family-friendly musical is based on the beloved children’s story The Trip by Ezra Jack Keats, who wrote and illustrated more than two dozen children’s books during his lifetime, including the Caldecott Medal award-winning The Snowy Day. The child of struggling immigrant parents in the 1920s, Keats was known for populating his books with characters of different ethnicities, introducing multiculturalism into mainstream American children’s literature. “Captain Louie” runs June 22nd through July 7th, playing Wednesdays, Thursdays and Fridays at 6:00pm and Saturdays at 2:00pm and 6:00pm. There is no performance on Wednesday, July 4th. Tickets are $20.00 (adults) and $15.00 (ages 13 and under) and may be purchased online at www.roxyregionaltheatre.org, by phone at 931.645.7699, or at the theatre during regular box office hours (9:00am to 2:00pm, Monday through Friday).